Tony Othen, our speaker last night, gave another perspective on the world of photography with his selection of images drawn from over 40 years as a professional photographer. Tony’s body of social documentary work derives from what he calls ‘the social, economic and physical’ conditions of people which he has captured across many countries. Tony worked on commission, mostly for educational or charitable bodies, and one of the most striking things about these images was while they seemed in many ways very distant, they were from the late 1960s and 70s. They came mostly from Wales, Derbyshire and London and Tony’s background to these images, the context and purpose they served, made for a very thought provoking evening. As Glyn Edmunds noted in his vote of thanks to Tony, we were honoured to have Tony with us, and how enjoyable it was to see black and white images from that era. Tony is now using these images in different ways. Those from Derbyshire have been shared with the residents of the now demolished community of Paulsborough (‘Spike’ to locals) as a means of community reminiscence, while others are used for educational purposes with children or as memory prompts in dementia settings. The images have, Tony explained, gained what has been coined as a ‘social action’ purpose in their secondary life. On a more prosaic note, there was also a reminder of the Club’s Emergency Policy and that of the Tangmere Village Centre. You’ll find copies of that on the registration table and in the small hall, and in it the importance of signing in on arrival – please do take a moment to familiarise yourself what to do in the unlikely event of an emergency. 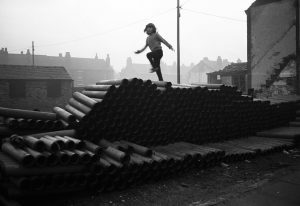 One of Tony’s images of children at play.